Metamorphosis peels back the layers of the immensely private life of Janet, sharing her transformation from a young girl with issues of self-esteem to global icon. 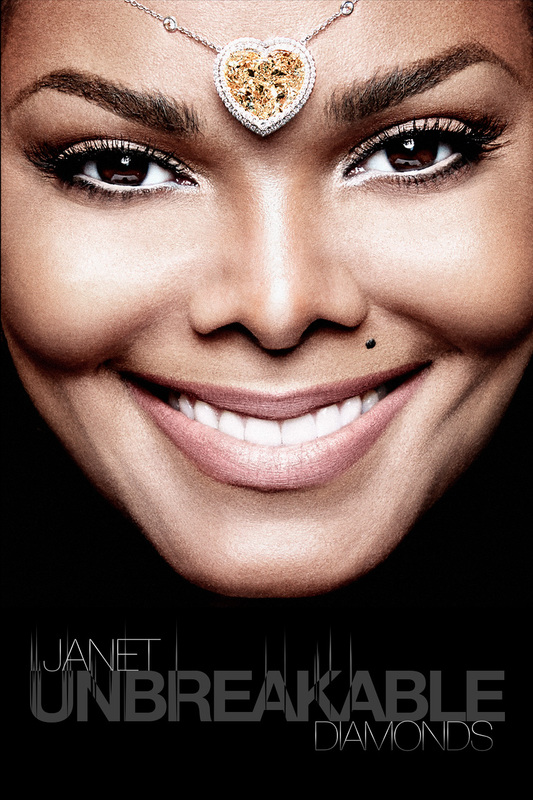 The centerpiece of her all new thought-provoking show, will be Janet captivating you through your senses with electrifying visuals, explosive dance numbers, chart-topping hits and fan favorite deep cuts. The show also features a special 30-year anniversary celebration of her ground-breaking album Rhythm Nation. You will follow her path to self-love, empowerment, motherhood and activism, amidst the challenges faced along her personal journey finding your own light through her Metamorphosis. 9/27 Seattle, WA – Ebony W.
9/28 Portland, OR – Faresa N.
10/14 Las Vegas, NV – Andrea H.
10/16 Salt Lake City, UT – Amber J. 10/17 Denver, CO – David M.
10/19 Kansas City, MO – Aleisha G.
10/21 St. Louis, MO – Dani J. 10/22 Milwaukee, WI – Jacqueline H.
10/25 Moline, IL – Allison W.
10/26 Chicago, IL – Robbie S.
10/28 Toldeo, OH – Anthony W.
10/29 Detroit, MI – Kelly M.
11/1 Grand Rapids, MI Deanna L.
11/4 Buffalo, NY – Carmen R.
11/5 Boston, MA – Michelle M.
11/7 Providence, RI – Lillian S.
11/8 Manchester, NH – Lauren W.
11/13 Philadelphia, PA – Angel P.
11/15 Brooklyn, NY – Arianna F.
11/16 Washington DC – Shayla A. 11/18 Baltimore, MD – Cicelia J. 11/19 Newark, NJ – Joshua M.
11/26 Indianapolis, IN – Kiara F.
11/28 Columbus, OH – Jordan M.
11/29 Pittsburgh, PA – Cheryl M.
12/1 Louisville, KY – Renee B. 12/3 Cleveland, OH – Taja S.
12/6 Memphis, TN – Rhonda B. 12/7 Nashville, TN – Nicole H.
12/9 Birmingham, AL – Shani C.
12/11 Fort Lauderdale, FL – Leniqueca W.
12/12 Jacksonville, FL – Breaunna D.
12/14 Norfolk, VA – Mary B. 12/16 Columbia, SC – LaDovia W.
12/17 Atlanta, GA – Mariah G.
Entries for fan artwork has closed. Thanks for Coming to the Show and Participating in A Meet & Greet with Janet! The photo archive has closed. Please e-mail janetjackson@support.sparkart.com for access to your photo with Janet. For inquiries, please contact PaulRapsNY.com. See Global music icon, multiple GRAMMY® Award-winner and multi-platinum selling artist, the incomparable JANET JACKSON on her STATE OF THE WORLD North American tour this fall! Produced by Live Nation, the tour is set for a 56-city run beginning September 7, in Lafayette at the Cajundome. Janet will make multiple stops in Texas and California, hit all four corners of the U.S. visiting Seattle, Portland, St. Louis, Milwaukee, Chicago, Boston, Philly, Memphis, Jacksonville, as well as head north of the border to include Vancouver and Toronto, with her final stop on December 17 in Atlanta at Philips Arena. Full itinerary below. Tickets for the newly scheduled dates are on sale now. Tickets held for previous Unbreakable tour events that are now re-scheduled will be honored at the new dates. The legendary entertainer began her sold out Unbreakable tour in August 2015, but just one year ago she reached out directly to fans via Twitter with news of her focusing on starting a family, confirmed months later with the arrival of her first child. Since, she has taken the past year to enjoy pregnancy and motherhood, and is now ready to return to the live stage to give Janet fans everything they could hope for in one epic concert event. The tour is a continuation of the Unbreakable tour and will include fan favorites from her chart-topping ‘Unbreakable’ album, an array of her socially conscious music she’s released throughout her career, and other smash hits and soon-to-be released new tracks with a state of the art live production!
? 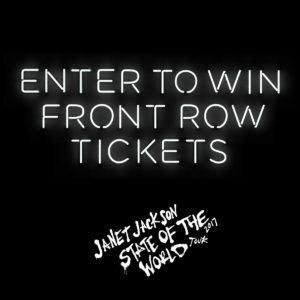 We’re giving away a pair of FRONT ROW tickets to almost every show on the State Of The World Tour ? 1) SPONSOR: Janet Jackson, Black Doll, Inc., Sterling/Winters Company, Sparkart Group, Inc., and their respective affiliates and subsidiaries, advertising and promotional agencies (collectively, “Sponsor and its Agents”). 2) SUBMISSION TERMS AND CONDITIONS; SPONSOR’S OWNERSHIP AND USE OF SUBMISSIONS; YOUR AGREEMENT TO UNRESTRICTED USE: For good and valuable consideration the sufficiency of which you acknowledge, by entering your Submission, you hereby grant, transfer and convey to the Sponsor and its Agents all rights, title and interests in and to the Submission, including but not limited to the irrevocable, transferable, royalty-free right to trademark, copyright, reproduce, encode, store, copy, transmit, publish, post, broadcast, display, publicly perform, adapt, exhibit and/or otherwise use or reuse (without limitation as to when or to the number of times used) your Submission (as submitted or as edited/modified in any way by the Sponsor and its Agents, in the sole discretion of the Sponsor and its Agents) on the JanetJackson.com website, other websites, in concerts, on merchandise, for television, motion pictures, in home video copies, and in other media, whether now known or hereafter invented, throughout the world for any purpose whatsoever, without limitation, and without additional review, compensation, or approval from you or any other party. a. You acknowledge and agree that you have no right of approval or consultation with respect to Sponsor and its Agent’s use of the Submission. b. You agree to provide the Submission at no cost to Sponsor and its Agents or any other party. c. You represent and warrant, and agree to further do so in writing, that you possess all necessary rights and authority to grant, transfer and convey to Sponsor and its Agents all the rights herein granted. d. You represent and warrant, and agree to further do so in writing, that the Submission is wholly original with you and does not and will not violate the right of privacy or publicity of, or constitute a defamation against any person or entity and that it does not and will not infringe upon or violate the copyright, contract rights, proprietary rights, or common law rights or any other rights of any other person or entity. e. You represent and warrant, and agree to further do so in writing, that the Submission has not been entered into a previous contest or has received any awards and has also not been published previously in any medium. f. You agree to indemnify and hold harmless the Sponsor and its Agents and their respective officers, directors, employees, agents, parent companies, subsidiaries and affiliates from and against any and all claims, liabilities, demands and expenses (including, but not limited to, reasonable attorney’s fees) arising out of or resulting from possession or use in any manner of the Submission. 3) If you do not agree to all of these terms and conditions then please do not enter a Submission.